I'm building a true Weslake speedway based B50. 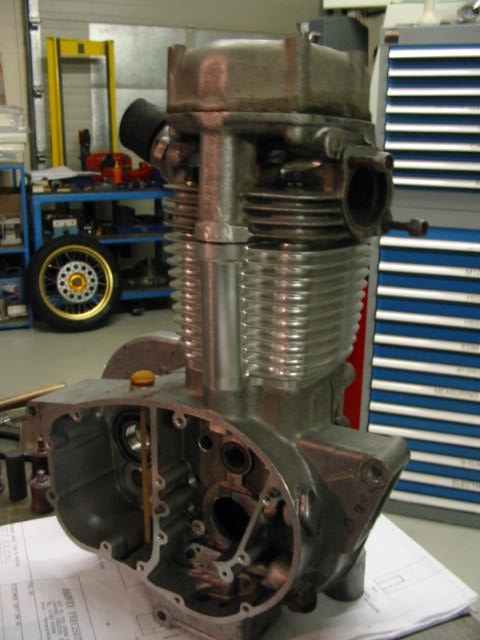 Yeh I know about the Weslake CCM that looks like the speedway engine but in a number of very important areas they are different:Bigger bore shorter stroke, a steep and straight downdraught on the inlet with wider cylinder stud for unrestricted ports. Truth is the Weslake engine was designed without restriction (FIM max inlet port sizes came later) where's the CCM top end was designed to be retro fitted to an existing design. Also Weslake won three World Titles with these engines okay I know they weren't competing against 2-strokes but a World title is a World title X 3. My job gives me access to equipment that allows me to undertake a number of jobs to help along the way. So to start with I measured the Weslake and BSA parts and with a CAD program drew up a cylinder that fitted between them both. This was then CNC machined out of a solid billet as it's quicker and a lot stronger than a cast one. Here it is loosly fitted to the bottom end. I have designed the cams so I can make them myself using modern toolmaking equipment (wedm) that I own so the cam lobes are seperate (like a number of OHC British racing engines of old) with a keyway each just like the one the cam gear has. I know what lift curves I wanted but it's complicated as you cannot just wrap the lift curve around the camshaft as the flat cam follower has a sliding motion across the cam lobe face. If you look at the very top dotted line in this odd looking drawing you can see the lift curve at the pushrod. 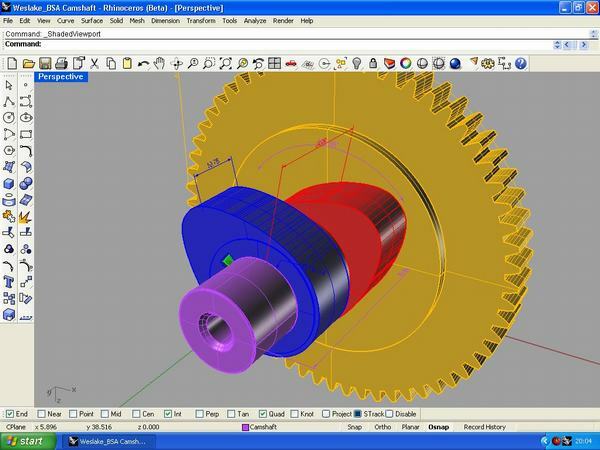 If you look at the right image you can see the follower in four seperate positions that represent the lift at that point plus the base radius and the point the cam follower touches the cam form at that lift. On the left hand side is the the follower with the base radius and the lift rotated around the cam in 1 degree increments you can now see how the cam lobe is generated by all of the intersections of the follower as it goes around the shaft (shouldn't that really be the other way ). In the above image the lift was scaled up X100 and a graph was switched on to analyse the curvature. 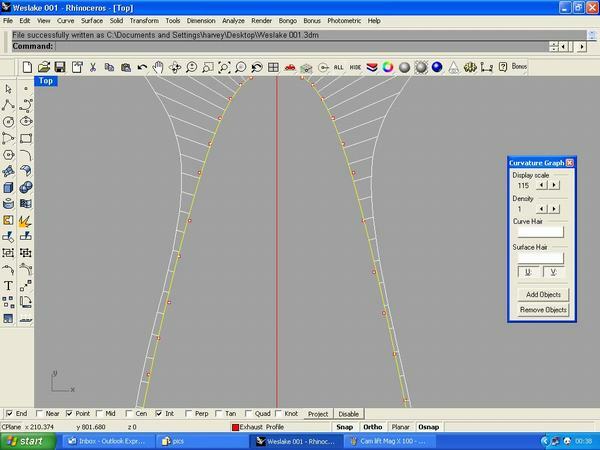 In the above picture a smoothing routine has been applied to the curves and the difference is clear to see. All of the above was done a while ago and I'm working on the cycle parts at the moment. Obviously projects like this can take a while (especially having a young family and trying to run an engineering business in the global economy) so it may be a while before I post the next instalment but as soon as the frame's rolling I will post something. Last edited by JB on Fri Feb 16, 2007 10:40 pm, edited 1 time in total. I am sympli jealous. it is surely the right way get at the best possibel point. 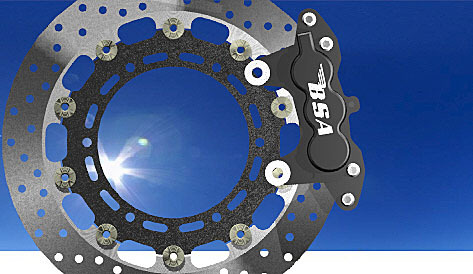 I've been busy recently with the front end and will post some more pictures once I have finished the new six pot caliper that I've been messing about with on the computer as you can now see below. I'm still learning how to create computer generated images from computer designed parts, it can be really good fun doing this sort of thing but it can also sometimes become a bit too much of a distraction from what you are trying to achieve in reality. The caliper has been designed to clamp straight onto a T140 disc brake lower leg that I've fitted to longer than standard X75 stanchions with special fork yokes. Last edited by JB on Sun Mar 11, 2007 9:14 pm, edited 1 time in total. Just for info John, Norman Hyde do a floating disc for the Trumpet front end, but it isnt as pretty as yours. Are you going to get it made? I've done pretty much all the machining for this front end, after that the caliper body will be sent off for anodising. I could fit a Hyde floating disc but I'm trying to build a stonking modern B52 hence the six pots and not a boring old two anyway this will be all my own work .....just how I want it. Wow! nice work and math. I am glad to hear you are going with billet. The shop I do sales for will have a 4 axis waterjet soon and I had been wondering if billet would be the way to go. I will remove a ton of material with the waterjet then finish by milling. Did you use 7075 or 6061? great artwork as well. -seems you could almost develop the first cammy unit, desmo who? had a 4 valver 500 head years back set aside for me but no access to macine shop so passed on it ooopps! Riding a BSA each day keeps you young......and on your toes! http://www.britgaskets.com My host for .ca broke like a B25 in a 17 year olds hands. Steve, In this instance I used 6082-T6 (old uk HE30) simply because I had it to hand and it's good enough for what I want this grade is similar to 6061 that is more common in North America. You could use 7075 but it would be overkill, remember on production bikes they are only castings. John, if you are going to make one, why not make a dozen? I'm sure you could fund your project by selling spares to the Forum members. If you don't want to make a dozen, make two and give one to me for my project. 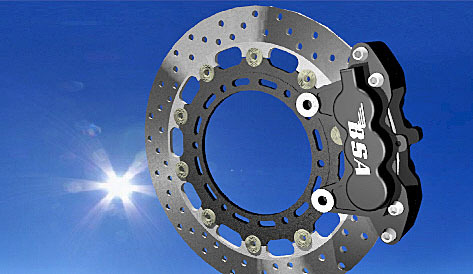 Minety, I'm open to making a batch in the future but at this stage I will need to test this one properly before then, I have had some input from a guy near to me who makes suspension parts for WRC & F1 and more importantly in this instance six pot calipers for racing Porsche's. Give me a shout when you want hoses John. We are the manufacturer, and just up the road. And, no, we are not in Exeter ! Great posting im thinking of trying the same for my road race b 50 after talking to a guy at cadwell who has built speedway bikes using weslake and b50s he has been developing for twenty years he claims to have made a b50 into a 650cc using a weslake barrell head and cam and an output of 60 bhp true or not i dont know but the guy seems genuine and is bringing me a head barrell and cam to Stafford show to look at it would be nice to keep up with the manxes and patons absafs ect keep up the good work and thanks for some very interesting info. Now we're in winter I will be picking up this project again so there will be more posts to come. 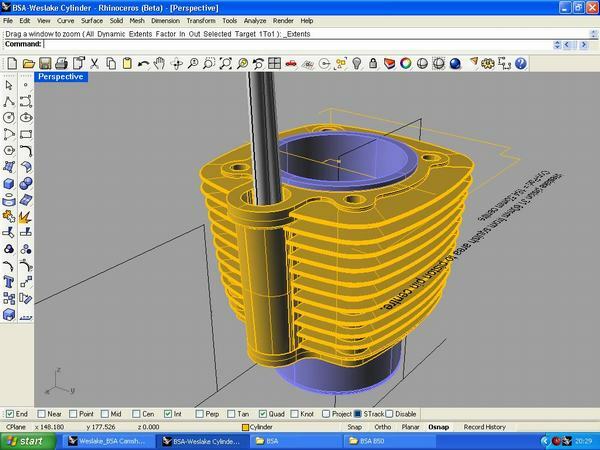 I often wonder about this as I'm still playing catchup in the CAD CAM world. This is way more worthy of a 60 min show on Discovery Channel, outstanding JB! 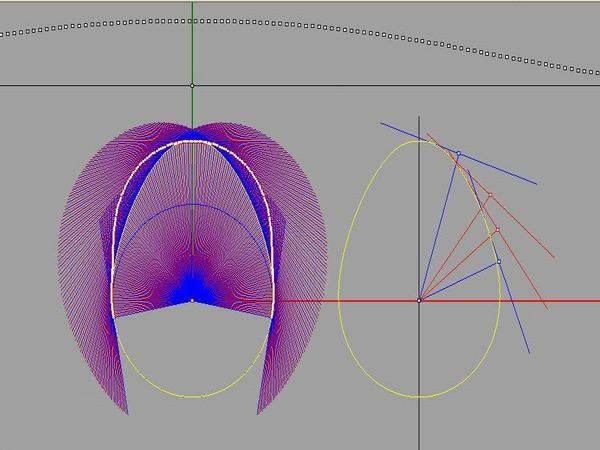 Mark Cook wrote: I often wonder about this as I'm still playing catchup in the CAD CAM world. Hi did you ever perfect the 4 valve head?